Anyone who follows fashion can always trace what they wore at poignant moments in their life; it is not uncommon for someone to be able to tell you what they wore to a high school football game, a job interview or a first date. It is mad and morose but any trend-setter or stylish senior citizen will, without pause, describe in detail exactly what she/he will wear for their burial. Such was the case for Amanda. While developing this collection and reflecting on her own battles with faith and fate she asked herself, “What would people wear to my funeral?” In turn she created a funeral ceremony so posh her mourners would be nominated for Vogue’s Best Dressed List. DeLeon is proud of her entire collection for Fall 2012, yet she is especially fond of a few items: a three-piece red wool suit, a grey cape and garments made from a silk fabric she fashioned from her photographs. Amanda and her husband shot some pictures one afternoon in Greenwood Cemetery and sent them off to be screened on a roll of silk fabric. The pieces created from this fabric will be sold and a portion of the proceeds will go to Save Our Cemeteries. The color palette she uses is typically grey and black, with that projected pop of red . The fabrics for each collection are always wool, leather and silk. Nestled a block off of Maple Street on Adams and surrounded by great shopping such as Swap, Em&Liv, Angelique and the Encore Shop, this precious and perfectly curated home and clothing boutique seemed to pop up overnight. Hattie Sparks is a fitting addition to Maple Street retail; her price points fall rightly between your designers at Angelique and the previously loved fashions at Swap and Encore. The wares at Hattie Sparks are ideal for the upcoming festivals and perfect for a quick hostess gift at your next dinner party. 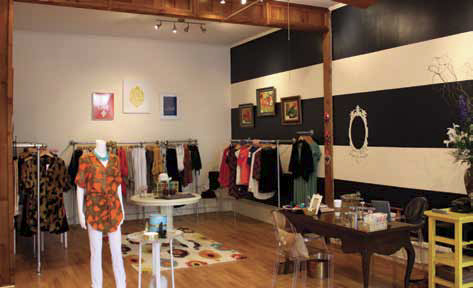 Owner, Hattie Collins Moll, wanted a thoughtful and purposeful shop. Hattie has been contemplating opening her own place for a few years and after obtaining experience in management from large-scale retail and hotel event planning, it seemed like Spring 2012 was the right moment. Hattie, originally from Texas, drew ideas from retail in her home state and her love of fashion created a quant lifestyle boutique in New Orleans. Hattie Sparks is a space centered on “how women like to shop.” Ms. Moll did extensive research on her products and can talk passionately about the merchandise in her store. It is apparent she did not go to market and point randomly to fill the racks and shelves. She carries carefully edited jewelry created by both local and southern designers, dresses and shorts ideal for everyday wear, stationary and fragrances. The clothing Ms. Moll carries is endearing and reasonably priced; nothing is over $130. Hattie Sparks is a charming shop to peruse, perfect for a Saturday morning drop in after working out or in between running errands. Grab a fresh dress for Wednesdays in at the Square and a chic bracelet for your BFF’s birthday.